How do I set up a 'Petty Cash' ledger that is outside the UVS calculations? This help section discusses how to add unit transactions for club members, using the 'add subscriptions' button. The 'add/edit' button under the 'view transactions' section, provides the maximum flexibility when managing Unit Transactions, however for ease of use the 'add subscriptions' button should be used for managing monthly club member subscriptions. One of the very powerful advantages that timetotrade offers, is the ability to see the state of your accounts at any point in time, simply by adjusting the 'end date'. This functionality also extends to the Unit Valuation System, as you have the ability to change the 'end date' and view the historical unit value for the selected date. An IMPORTANT point to note: when working with Unit Valuations on the 'uvs' tab it is important to remember that the selected 'end date' determines not only the displayed unit value but also the unit value used to calculate and allocate subscriptions. So it is very important that the 'end date' is chosen correctly. Another IMPORTANT point: once you have added member subscriptions the unit value and units purchased with that subscription are set and will NOT be automatically amended if you then have to make retrospecitve changes to the income/expenditure or investments tabs (for example, you forgot to enter a dividend payment). The 'amount' field is pre-populated with the same subscription value as used in the previous month. The amount can be overwritten if needed. If all of the information is correct, click on the 'add subscriptions' button. When finished click on the 'cancel' button. To exclude a club member from the monthly unit subscription, un-tick the check box associated with their name. The 'date' field is automatically progressed each month to the same date that was used in the previous month, therefore it is good practice to use the same date each month for entering club member subscriptions. An IMPORTANT point to note: the pre-populated 'unit value' is the unit value as at the selected 'end date' and NOT the date shown in the 'date' field; if you change the 'end date', the unit value will change accordingly. 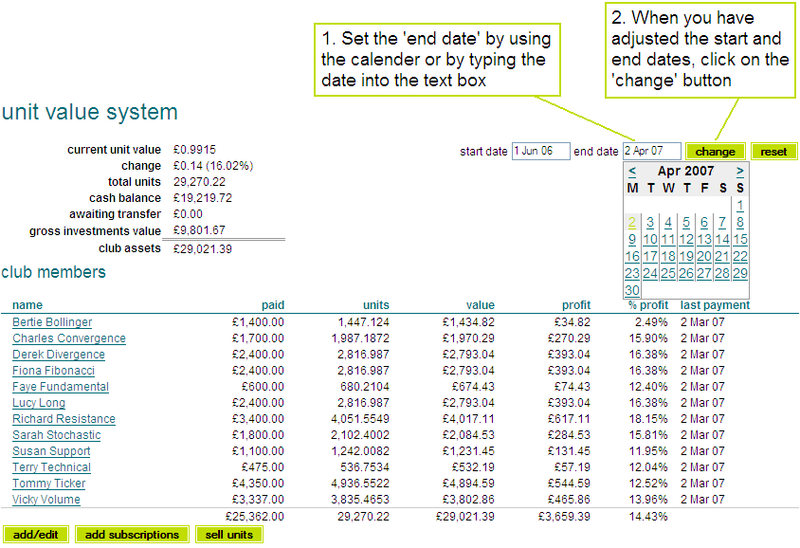 In the above example, if we had set the 'end date' to say, 31st May 2007 the unit value used to calculate the unit distribution would have been the unit value as at 31st May 2007, even though the date shown in the 'date' field is 2nd April 2007. Another IMPORTANT point to note: once you have added member subscriptions the unit value and number of units associated with that subscription are set, and will NOT be automatically amended if you then have to make retrospective changes to the income/expenditure or investments ledgers. For example, you have allocated your monthly member subscriptions and then realise that you have forgotten to include some dividend income in the investments ledger, which you then retrospectively enter. The unit value associated with the member subscriptions you have already input will then be inaccurate and not reflect the extra dividend income. So, if needed you can change the unit value used for historical unit transactions, by editing the historical unit transactions and using the re-calculated unit values.